CropStop: Challenge #3 Squares and Die Cuts! 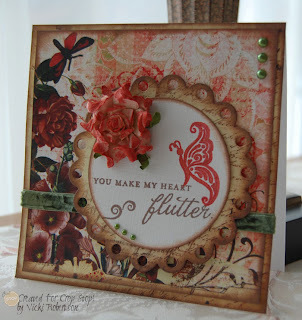 Challenge #3 Squares and Die Cuts! Wow, it's time for Challenge #3! This week's challenge comes from Gloria. 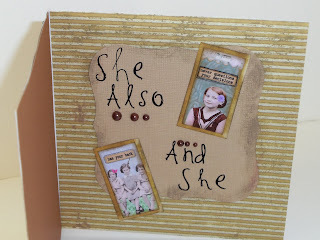 Her challenge is to create a square card or layout and use a die cut shape on it... any kind of die cut shape, Spellbinders, Tim Holtz, Cricut, Sizzix, etc. Just be sure your project, a card, layout, etc. is square and includes at least one die cut shape! You will need to complete and link your project using the Linky Tool at the bottom of this post by January 26th at 11:59 pm EST in the U.S. CropStop will randomly choose one prize winner and the Creative Team will choose two of their favorite projects to receive our "Cream of the Crop" blinkie to display in your blog and signature! 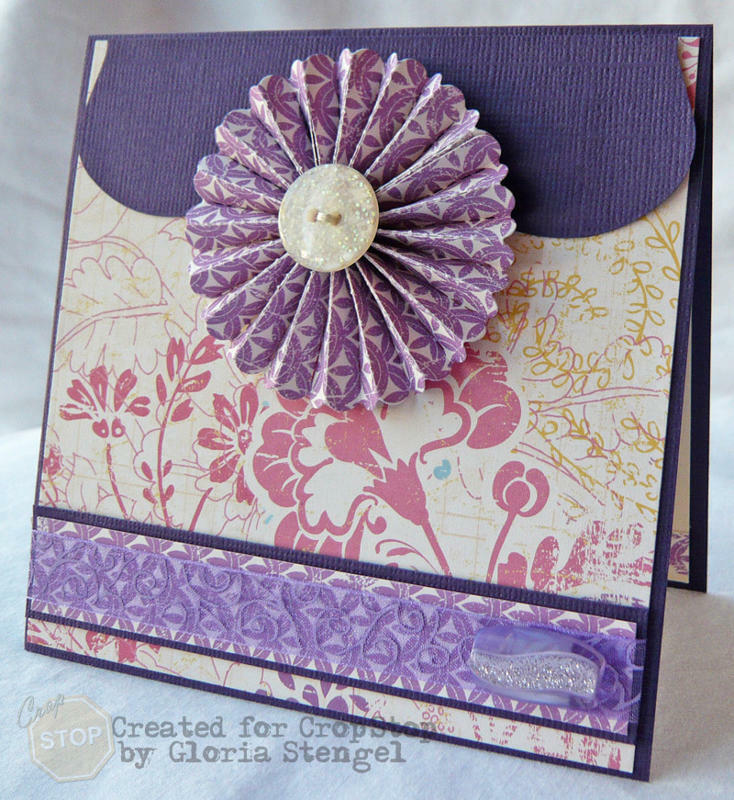 Vicki used Spellbinder Nestabilities, Eyelet Circle and Standard Small Circle die cuts. Dalis opted for Spellbinder Nestabilities too, Labels 3 and Labels 17. 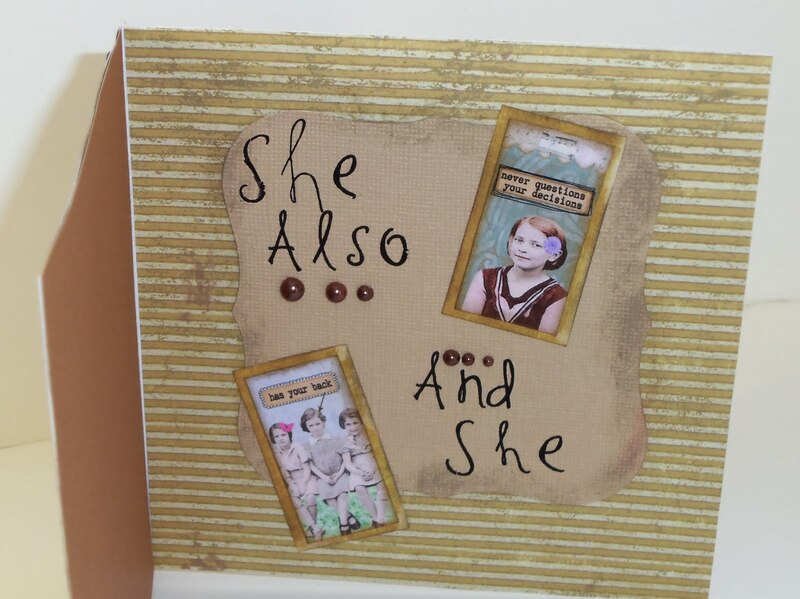 Martha Stewart's Modern Garland Edge Punch and Tim Holtz Distress Ink, Shabby Shutters are also used on Dalis's card. 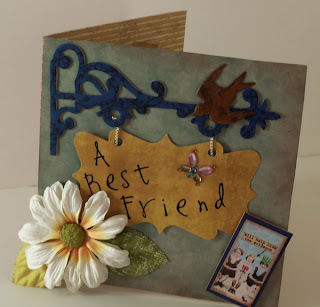 Veronica used her favorite Tim Holtz products on her card, the Bigz Hanging Sign Die and Frayed Burlap Distress Ink. On the inside of her card, Veronica used the Spellbinder's Labels One. The card was made with Elements Core'dination papers available in the CropStop Store. 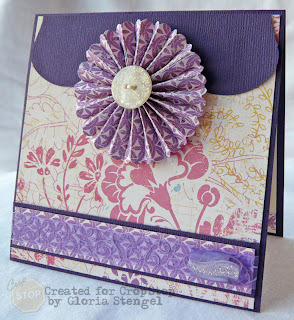 Gloria, another fan of Tim Holtz, used the Movers & Shapers Ornamental die and the Paper Rosette Decorative Strip die. 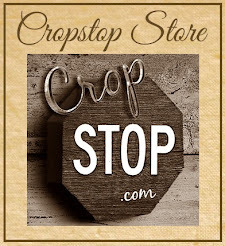 The Lavender on Lavender Organdy Swirl Ribbon can be found in the CropStop Store. Sounds like such a great challenge - and the DT projects are incredible! It seems as though the projects from the first challenge have somehow been listed here though. You might wish to have a look at that and make an adjustment. I loved this Challenge. And of course anything Tim makes. 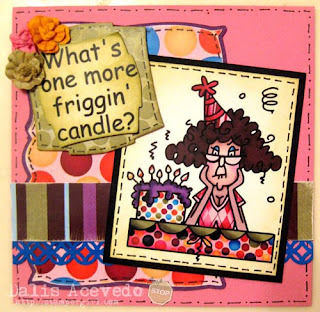 Dalis, the verse on your card is priceless...too funny. The DT's cards are great, as always ! Thanks for this challenge - I had fun. Congrats with a beautiful blog!! Wondered if I can ask a favour ? Could you please add 2 clocks that show your whatever you call it time,and say London, Europe as well as that would make it easier to submitt contributions on time.. Tried to link up, but the linky closed a little early. Just wanted you gals to see the card I made for the challenge.